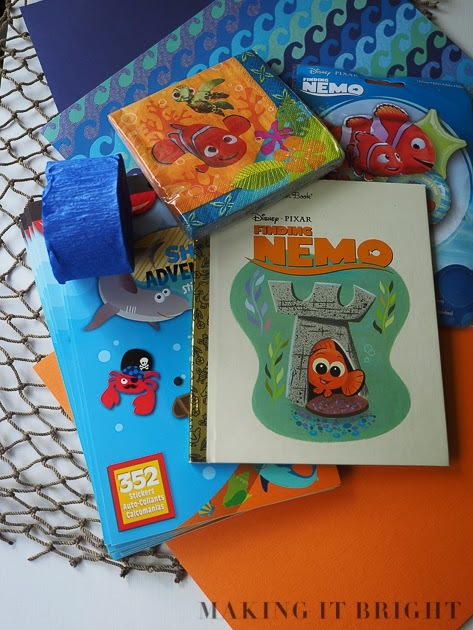 Here are the details on my little man's 3rd birthday party. If you recall from the teaser post, we were all Nemo (or "Mee-mo" as he calls him). Unfortunately, we were so busy having fun with friends and family that we failed to take a lot of pictures. I guess that's the best indication of a successful party. 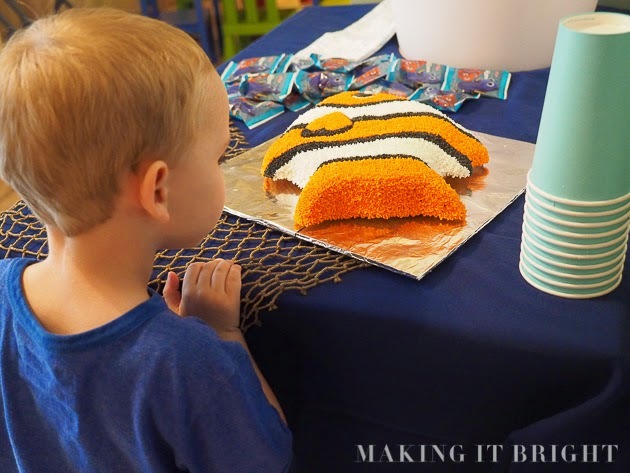 I used the clearance stickers, some blue and white bakers twine, and tags made from orange paper with my tag punch to make cute "Thanks for swimming by!". Cute and simple favors. And who doesn't need more stickers? Our house is not terribly large and doesn't have an open floor plan-- yay mid 80s construction. The layout is basically a circle around the stairs-- living room, kitchen, dining room. So we really push the limits of our house with our party guests. 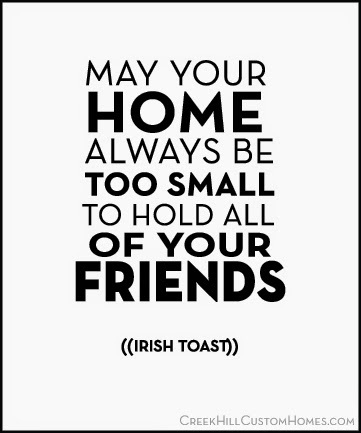 And I can't help but think of this Irish toast. So we rearranged furniture in the living room, pushing the chairs closer to the couch, setting up a few folding chairs, and putting together two kids' tables from IKEA so all of the kids could sit together and eat. I covered both tables with an orange plastic table cloth and taped the edges to the legs and underside of the tables with blue painters tape. What tape did show went with the theme and was easy to remove after the party. 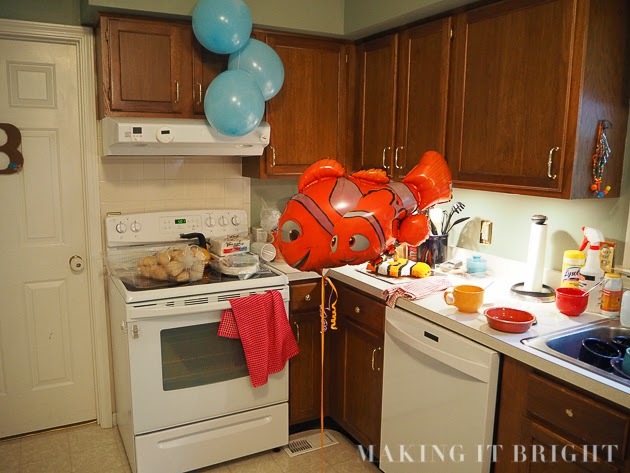 I had a few of the mylar Nemo balloons we had purchased from Amazon around the living room, and we had a slideshow going on the TV of pictures of our little guy from birth to three. We strung dark blue and light blue balloons across the windows to add a festive touch. We set up a long folding table in our dining room and a card table. I used a blue green table cloth that I had for the long table, and my little lady painted a piece of kraft paper for the card table, with blues and greens and white to look like the ocean. I added in clusters of black, orange, and clear balloons around the room. Like clownfish swimming about. Over the large entry into the dining room, I hung a banner spelling our little man's first name made from the ocean paper I bought at Michaels. I used this tutorial. I alternated ocean and navy circles since the paper was reversible, and I used white printer paper for the letters. The font I used was Gill Sans Ultra Bold. It looked like the letters used for the Finding Nemo title. So easy and cute. I'm saving it to hang above his bed. I used our dining table, with the sides folded down, in front of our pantry door as the drink table (below). I used a dark blue tablecloth that I had and a white metal drink bucket that I got from Target several years ago. Great purchase. The drink tub was filled with sodas for the grownups and juice boxes for the kids, and we also set out a pitcher of water with the cups photographed below (left over from our daughter's Little Mermaid party a few years ago). We placed the cake on it for a few pictures and then moved it to safety on the counter. What kid could be able to resist touching that beautiful cake? Our kitchen has a large peninsula that we use every year to set up the food. We serve dinner at our parties since our families travel from out of town. This year we had Turkey Chili and Tortilla Soup. (Double batch of each recipe to feed around 20, had some leftovers. For the tortilla soup, I add in a can of white beans-- 1/2 pureed and 1/2 whole-- to the crockpot after it has cooked to thicken up the soup. If you want to stretch your leftovers, serve it over brown rice.) Make the soups a day before and start heating them in the crockpot about 2-3 hours before you want to serve them. It took a long time to warm them from refrigerated temp. I borrowed two giant, matching crockpots from my mom for the party. DELICIOUS! We also got a deli tray from Costco and some of their french rolls for sandwiches. I couldn't find the Chinet bowls I like to use with soups at parties, so we just used my Fiesta collection of bowls and soup mugs. Worked great! I had some clear spoons and orange forks for the cake. 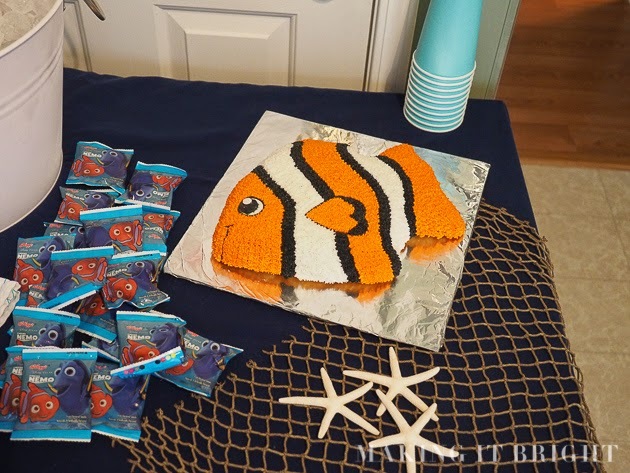 We used white napkins for dinner and the Finding Nemo beverage napkins for the cake. Wilton tropical fish cake pan - My husband makes the cakes and he was able to find this one on eBay for $25. No way was he going to pay $25 so he offered $12.50 and the seller accepted. It had never been used and still had the original label attached. He decided to use different coloring than the Wilton colors and it turned out great and tasty. He said that these were much easier to work with as far as mixing the colors. Our little man had an awesome party and got way too many presents. I love parties and having friends and family in our home, as crowded as it seems at times. And as long as it takes to clean up. I left the orange, black, and clear balloons in the dining room-- Halloween colors! I can't wait until the next party. My little lady will be 6 (how is that even possible?!?) in the summer. I wonder what crazy theme she'll decide. Did I leave out any details? Probably. Comment with a question and I'll respond. I love parties!